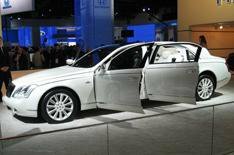 Maybach Landaulet | What Car? You may think it looks ridiculous, but not everyone agrees after being shown at last November's Dubai International Motor Show as a concept car, the Landaulet is going into production. It remains in concept car form in Detroit, but few expect its extremes to be toned down that much by its conversion to the, ahem, real world. Based on the Maybach 62 S and 57 S, the Landaulet is powered by a 607bhp twin-turbocharged V8 and features air suspension, stability control, anti-lock brakes and several other handling systems to ensure nobody spills their G&T. The car is painted white, with white upholstery, white wheels and with the Maybach name embroidered on the white rear section of the collapsible roof you guessed it, in white. Just in case the chauffeur has forgotten his station in life, though, it's worth noting that the roof on the front section of the car does not fold down, remaining a hard top, and, just to hammer the point home, the interior in the driving compartment is coloured entirely in black. What does it cost? We did ask, and we were told that there are too many customisation options to pin an individual price on the car. Which probably means that if you have to ask, you can't afford it.